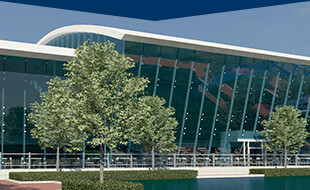 In July 2012, Greenville Spartanburg International Airport launched WINGSPAN, the terminal improvement project. The projected four-year program was composed of three phases that would allow for a higher volume of travelers, be more environmentally friendly, and improve aesthetics throughout the facility. Since WINGSPAN is nearing completion, we thought we would share a little more about the three phases that will dramatically shape Greenville-Spartanburg International airport to one of the most operationally capable and efficient airports of its size. When WINGSPAN began in July 2012, a gallery of photo renderings and a virtual walkthrough was created. Scroll through the galleries and let us know how you think the updates are progressing!